Most deer-vehicle accidents occur during the months of October, November and December. Another peak occurs in May and June as one-year old deer are dispersing to new areas. However, accidents can happen at any time of year. Deer are crepuscular, meaning that they are active at dawn and dusk. So it is not surprising that most accidents involving deer happen between the hours of 5 to 10 p.m. and 5 to 8 a.m.
Be aware of your surroundings. Pay attention to deer crossing signs and scan the roadsides for the “eyeshine” of deer (reflection of headlights in the deer’s eyes). At night, use your high-beam lights when appropriate. This may allow you to see the deer a few seconds earlier, giving you enough time to avoid an accident. Deer often use woodlots, fencerows, field edges or areas near water. Extra caution is needed when these habitats are close to roadways. Slow down around curves in areas where deer are known to occur. 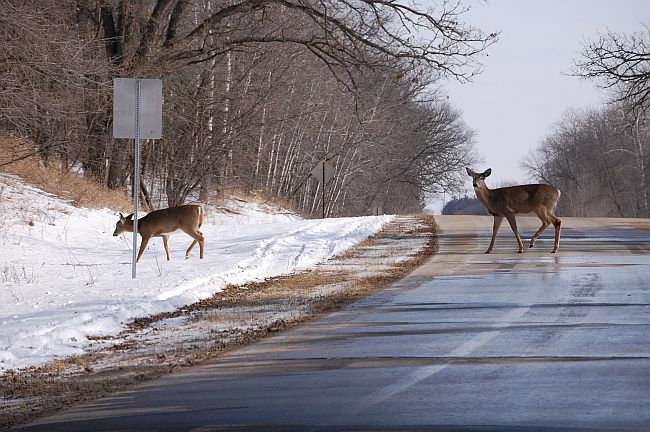 Slow down and prepare to stop if a deer is near the side of the road—there are likely more deer nearby. Deer will often follow one another single file across a road. Trying to cross through the middle of such a group often results in deer colliding with the side of the vehicle. Be prepared for the unexpected. Deer may stop in the road or decide to double back to the side of the road. Hard pavement provides poor traction for deers’ hard, sharp hooves. They may slip or even fall down. If there are deer near the road, slow down, honk the horn in short bursts and flash the headlights. Tap the brakes or use the emergency flashers to alert other drivers. Prepare to safely stop if the deer move toward the roadway. If there are deer on or approaching the road, do not slam on the brakes or swerve sharply to avoid the deer. It is instinctual to do this, but doing so may cause a loss of control of the vehicle and a more severe accident. Never tailgate! Always leave plenty of room between vehicles. Many severe deer vehicle accidents are caused when another vehicle becomes involved. 1. Pull the vehicle off onto the shoulder of the road and turn on the emergency flashers. 2. Attend to any injured passengers. Do not get out of the vehicle to check on an injured deer or to pull a dead deer from the road. Do not risk being hit by another motorist. 3. Call 911 to report the accident. They will dispatch the appropriate law enforcement officials to assist at the site. Illinois law requires reporting of accidents that result in $1,500 or more in damage; additionally, an accident report must be filed. 1. The driver of a motor vehicle involved in a vehicle-deer collision has priority in possessing a deer. If the driver does not take possession of the deer before leaving the collision scene, any citizen of Illinois who is not delinquent in child support may possess and transport the deer. 2. There is no limit to the number of deer that may be possessed under these circumstances. 3. Individuals who claim a deer killed in a vehicle collision shall report the possession of the road-kill deer to the Department of Natural Resources within 24 hours via this IDNR website or calling (217)782-6431 no later than 4:30 p.m. on the next business day. 4. Except for any law enforcement officers in the performance of their duties, it shall be illegal to kill a deer crippled by a collision with a motor vehicle. 5. No part of a vehicle-killed deer can be bartered or sold. 6. The State of Illinois is absolved of any and all liability associated with the handling or utilization of vehicle-killed deer. This does not, however, relieve involved parties from reporting other liabilities to appropriate agencies as required.